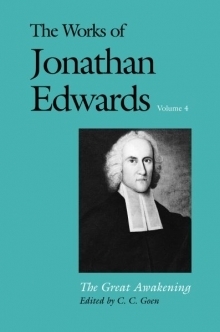 Interpreting the Great Awakening of the eighteenth century was in large part the work of Jonathan Edwards; whose writings on the subject defined the revival tradition in America. Moving from sensitive descriptions of "the Surprising work of God" in conversion to a consuming quest for the essence of true religion, and threading his way through mounting controversies over "errors in doctrine and disorders in practice," Edwards sought to locate an authentic core of evangelical experience, to define it in terms of biblical faith and psychological insight, and to defend it against both overheated zealous and rationalistic critics. The tracts that unfold his thoughts, presented here (with related correspondence ) for the first time in accurate critical texts, document a movement so significant for the American character that it has been called "our national conversion." In a carefully researched introduction, C.C. Goen identifies the "Arminian threat" to which the Northampton pastor responded at the onset of the Awakening, and traces Edwards’ understanding of vital religion as it developed in the ambiguous context of revivalism. Mr. Goen’s study also illuminates little-known aspects of A Faithful Narrative and describes the haphazard way in which that important work reached its eager audience. C.C. Goen, author of Revivalism and Separatism in New England, 1740-1800 (1962), is professor of church history at the Wesley Theological Seminary in Washington, D.C.